The end product looks like this..
What I did was this: I cut a piece of neoprene in a shape that would fit the back of my hand. I then sewed the 'soft' side of a large piece of Velcro onto the entire back of that. I then sewed on the straps. Make sure to do some heavy duty stitching here! After that was done, I put electrical tape on the bottom of all the electrical components, and then put the 'hard' side of some Velcro on them with an adhesive. Make sure to include the electrical tape, many adhesives are conductive and will give you short circuits if you apply them directly to the electronics. Now mount the electronics to the back of the hand. 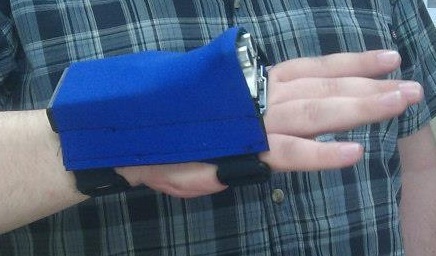 Using the stuff mounted on the back of your hand as a guide, cut another piece of neoprene to fit over the electronics. Now sew Velcro to the sides, and use this piece as a cover. You are done! Now you can just plug in the battery, and the glove will turn on. Operating it is simple, the closer the object, the higher the pitch. When something is in fingertip reaching distance, the glove will emit pulses of sound. When the glove senses a new object, it will have an audible beep. Experiment with it to find the best use! In my experience, I find that finding objects on a table is best done by sweeping the edge of the table with my fingertips till the glove locks on, then moving my hand forward till it pulses. This allows me to find objects as small as a shotglass without knocking them over. For navigation, sweeping left and right parallel to the floor works well. It is much like using a cane, only with a narrower angle. It works really well! How well? Works well enough to win an engineering design award! That is the end of this project! I hope you guys are able to make one of these to help your blind friends of relatives, and I encourage you to 're-mix' this project as much as you like! Also, make sure to check out Steve Hoefer's brilliant project called Tacit. 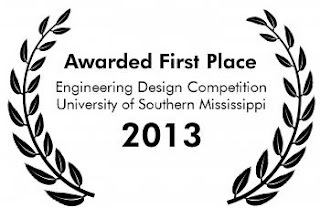 It works in a similar fashion to this project, but with some significant differences in design. I hope someone out there can use our ideas to make something truly special! Join award-winning engineer Michael Frink as he builds projects, and explores the joys of science! Time to get in the lab and get Frinky!